Once again, I failed to get much sleep before a mass run. A week earlier, it was the Army Half Marathon. 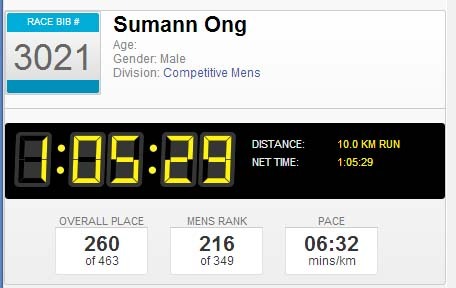 Yesterday morning, it was the Tanjong Pagar-Tiong Bahru Salomon Vertical City Trail run. I took the north-south train from Yew Tee to Jurong East where I transferred to the eastbound train for Tiong Bahru. I thought I should wake her but hesitated. I hate waking up other people, especially strangers. She would be so startled to be roused by a strange man (and I look stranger than most). I thought (or hoped) she would wake up on her own. Other people started boarding the train heading north, making me feel self-conscious. So I just left the woman sleeping on the train heading back the way she came. She's going to be so confused when she wakes up on the train going in the wrong direction. Anyway, I forgot about her by the time I reached the starting line at PSB Academy, where it was still raining lightly. It was only then that I found out the vertical part of the race – the 20-storey stair climb – was at the end of the 10km run. I had been training for the stair climb to be at the beginning of the run. I was screwed. Another surprise was seeing Tanjong Pagar GRC MP Indranee Rajah who was there to flag off the race at 7.30am. The race was mostly along public roads which WEREN'T CLOSED TO TRAFFIC for the event. I didn't pay $42 (instead of $45, thanks to a Passion card discount) to run and watch out for traffic at the same time. I could do that on my own for free. This is why I didn't join the Pioneer Road Run again this year. The run got interesting only after 7km when we had to use the overhead bridge at Lower Delta Road. That was a first. Another reason it's called the Vertical City Trail run, I guess. Then came the 20-storey stair climb in the very narrow stairwell of Tiong Bahru Plaza. As exhausting as the half marathon was a week earlier, I never thought to myself: "I'm going to die." When I reached the 19th storey at Tiong Bahru Plaza, I thought I WAS GOING TO DIE. My heart felt like it was about to explode. If it had been a 21-storey stair climb, I believe I would be dead now. I wondered how I'm going to survive the 73-storey Swissôtel Vertical Marathon in November I had just signed up for. When I reached the 20th storey at Tiong Bahru Plaza, I immediately went to the toilet to pee. That was another first. I then took a lift back down to the ground floor and collected my finisher medal. Not a very exciting way to finish a race. At least I got a banana. After eating the banana, I went home and slept until 4pm. Good thing I didn't fall asleep on the train back.